Ever since 9th grade Odyssey of the Mind, when our team’s problem for the year was to perform a timed skit in which we talk about the seven wonders of the world, I’ve wanted to visit this place. Why the tale of OM days of yore, you ask? Because, also as a part of the skit we needed to name and discuss our own seven wonders. The first thing we named was the Hagia Sophia. So this building has lived in my imagination for a loooong time, for so long I was worried that the actuality of being in the Hagia Sophia wouldn’t live up to my years of imagining it. 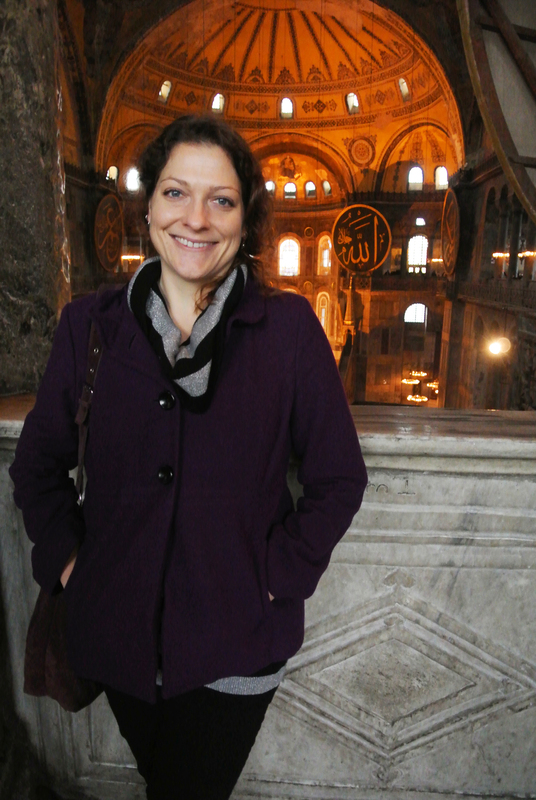 Happy to say that the Hagia Sophia does live up to the hype, and even the 15-20 years of mystique created by living in one’s mind. The top image was taken on New Years Eve about 30 minutes before midnight. Brother and I wandered there after spending a couple hours sitting in a pleasant covered outdoor cafe partaking in tea, snacks, backgammon, waterpipe, and a whirling dervish performer. Notice the few people milling about the fountain—as the time drew nearer to midnight, more and more people arrived to what eventually amounted to a large and friendly and mostly sober crowd. The roasted corn, chestnut, and salep street vendors regularly in this area were doing quite the steady business. This is tourist central of Istanbul, with the heavily visited sights of the Blue Mosque just on the other side of the fountain and Topkapi Palace closeby, but there were a large number of Turks in the crowd as well. As it turns out, the city sets off fireworks on New Years from each of the seven (if I remember correctly) highest places of the city—this was one of the typical gathering points to watch the fireworks. Munching on roasted chestnuts while watching fireworks right outside of one of my most favorite buildings in the world is really a decent way to spend a New Years Eve. The rest of the above images I won’t explain more than this: they are pieces of what I saw while looking around in wonder, and can’t compare to actually being there.